*NOTE: One great reason to use Google Classroom….most programs import through Classroom such as Pear Deck, NEWSELA, Quizizz, KAMI, Go Formative, Go Guardian and many, many more! If I were stuck on an island, with a classroom of students, and I was told I could pick one app for our magically working devices on said island, it would be Google Classroom, hands-down. If you are new to Classroom, you are in for a treat! It will help to transform your teaching practices. Even if you use it strictly for an agenda or your objective board, it will be a place students can refer back to all year. It can serve as a classroom website, housing all of your important documents (and much easier to post them). It can act as a teacher, when you are out, hosting assignments, videos, notes, and activities. You can check in from home, and view any student’s work at any time if it is distributed through Classroom. I’ve actually had students approach me in the hallway and have asked me to help get one of their teachers up on Google Classroom. Students love it, and it makes learning easier for all. It puts all of one’s courses in one single place, teacher or student, where you can access all material. Simply put, it is the best tool, period. Since it is Google, of course, it is always improving. There have been improvements even over the summer! 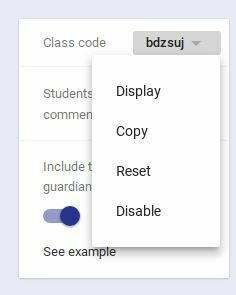 One of my favorite new features is the option to largely display the classroom code for students to join – this is great! No longer will you need to write it largely on the board or zoom in on your computer so students can see it. You can simply click the drop down on your code, click Display, and BOOM! Large Display for your students to see! Another quick tip – if you do not like your code, you can click reset until you get a code you like. I recommend codes without zeroes and o’s. An all letter code, like the one below, usually goes off without a hitch. 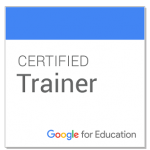 Another initiative Google for Education worked on over the summer was better training resources for Educators. The education team, with help from Google Certified Trainers, created The new Google Classroom Learning Hub. This hub features tips and tricks from Google Staff and certified trainers. I even made the cut and have a tutorial included (The About Tab). This is a great resource to check out! If you would like assistance creating or maintaining your Google Classroom courses, please reach out! You can book me for an appointment by clicking here (EB staff only). What’s your favorite feature of Google Classroom? Comment below and share the love!